Happy New Year from the Money-Guy team! It is great to be back after our holiday break, and we are very excited to share our thoughts on the economic outlook for 2012 in today’s show. 1. 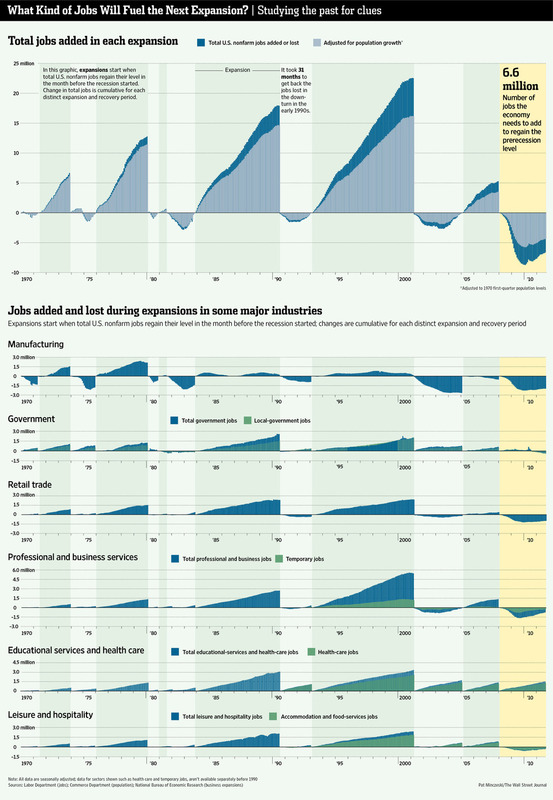 Jobs – This chart shows the history of job creation after past recessions, breaking it down by industry. Highlight: 6.6 million jobs currently need to be added to the economy to regain the pre-2008 downturn level. 2. 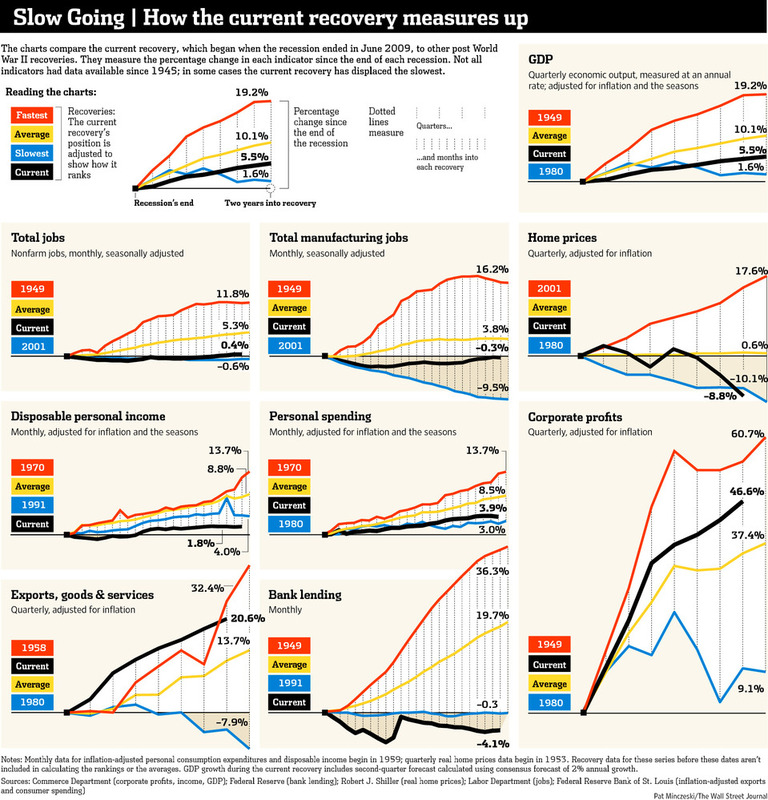 Comparing Recoveries – This chart compares the current economic recovery to past expansions based on GDP, jobs, home prices, incomes, and corporate profits. Highlight: The current recovery is the slowest in terms of disposable personal income and bank lending, but above average for exporting goods and services and corporate profits. 3. Consumer Spending – This chart illustrates consumer spending patterns since the recovery began. 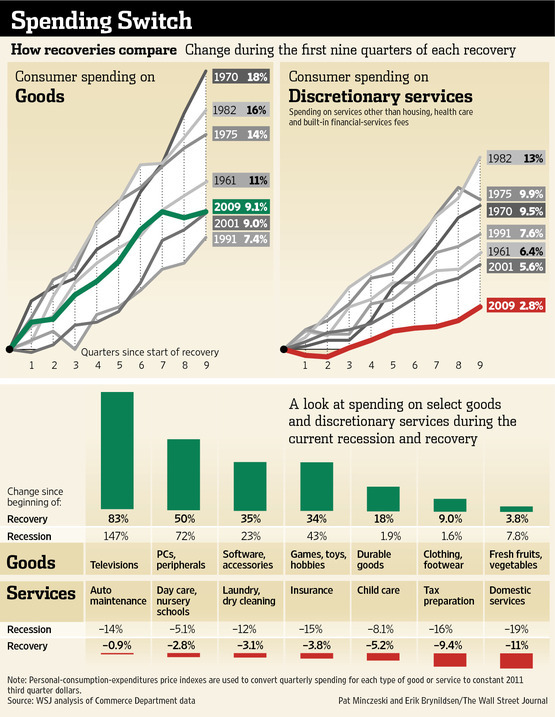 Highlight: Spending on discretionary services has continued to decrease. 4. 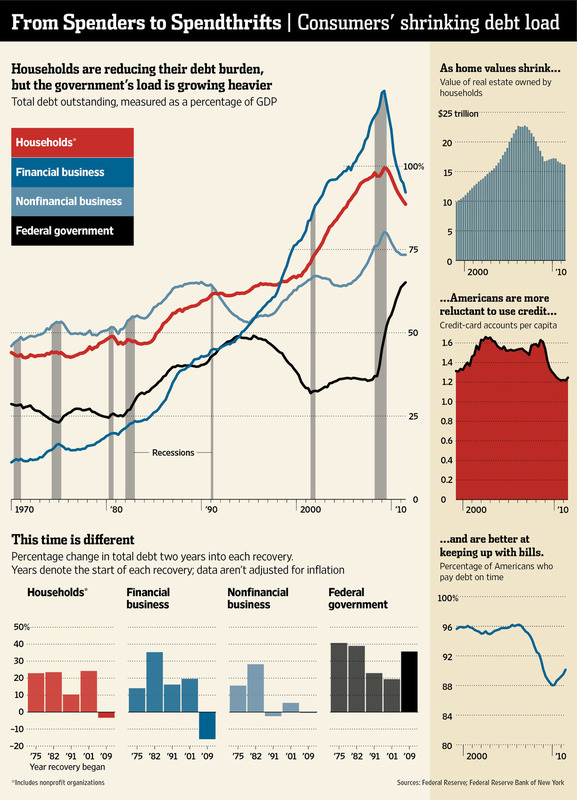 Debt – This chart shows debt patterns of households, businesses, and the federal government since 1970. Highlight: While households are reducing their debt burden, the government’s load is growing heavier. 5. 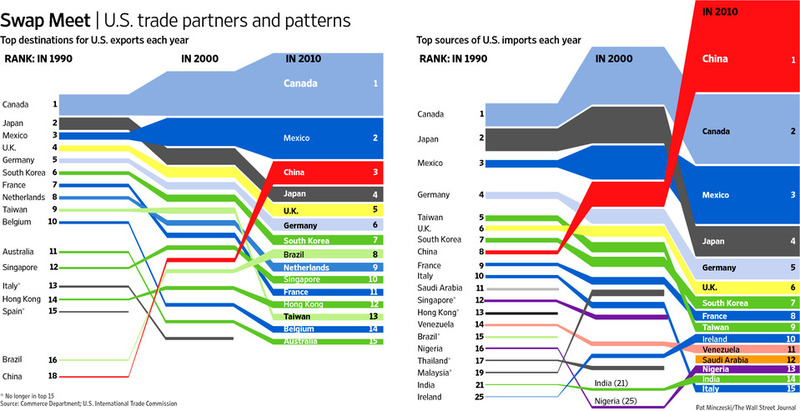 Trade – This chart follows U.S. trade with other countries since 1990. Highlight: China replaced Japan in the top 3 destinations for U.S. exports and imports, along with Canada and Mexico. Now that we have taken a look back, let’s focus on the future. Kiplinger’s Personal Finance magazine recently released Our Investing Outlook for 2012 and opened with Benjamin Graham’s theory: “In the short run, the stock market is a voting machine, considered by many the ultimate investing sage. But in the long run, it’s a weighing machine, meaning that over time a company’s shares will command the price its business prospects deserve, measured by such basic yardsticks as profit growth, balance-sheet strength and management vision. They predict continued volatility with both breakout rallies and occasional downward spikes for 2012. They also predict that profits for companies in the S&P will improve by 6% to 7% in the coming year. The housing market will be boosted by the government’s latest loan-modification efforts. Politics will weigh on markets. Successful investors will be those who take advantage of the ups and downs by dollar-cost-averaging. They also think the best opportunities lie in stocks as opposed to bonds, and in U.S. stocks rather than foreign companies. Here at the Money-Guy Show, we are optimistic about things in the coming year. While market volatility may persist, it is encouraging to see balance sheets on the consumer and business side improving. There are a lot of positive things happening and we are excited to see where 2012 takes us. We would love to hear your questions and comments below or on our Facebook page. Also, don’t forget to check us out on YouTube. Spending cuts will reduce annual deficits, but how to repay current debt without inflation or raising tax rates? Would you expect the economy to grow enough to cover the debt with revenue from current tax rates? I think that growth will be the largest factor, but there does need to be a combination of updating the tax code and spending cuts. One or the other will not fix the country’s issues; it will need to be a well thought-out combination of all three with growth being the primary objective. Thanks for the question! The podcast is great, and it seems to get better all the time. I listen to a lot of podcasts, and your always goes to the top of my list whenever your podcast comes out. With that said, I have one pet peeve with not only the podcast, but almost all financial advisors. That is, nearly all financial advisors won’t give specific stock or mutual fund advice to a general audience, but they have no trouble telling a general audience that they should all be saving the same amount (15-20%). I completely understand that saving is good for everyone, but why isn’t the amount someone should save as individually specific as the investments somone should make? Suppose two investors with nothing saved for retirement both earn the same amount, but one is 55 and one is 30. It would be ridiculous for someone to say both people need to save the same amount for retirement to maintain their current lifestyle. Clearly, the financial planner stands to benefit by suggesting everyone should save as much as possible, but that isn’t practical or very helpful. Instead of using a one size fits all statement for how much someone should save for retirment, you could do a podcast on the things you should consider when determining how much you should save. You could cover things like current longevity, how much you can take out without depleting you savings, health care costs, having or not having a mortgage, etc. When reading back over what I just typed, my tone sounds harsher than intended, so please know that I didn’t intend to sound so grumpy.